Another important skill is identifying the parts of speech of a sentence or passage. 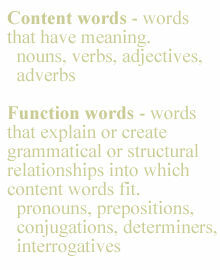 What is the function of the term? Understanding the combination of parts of speech that make up a sentence will most certainly help you understand what the author is saying. For those who desire more, consider a deeper Bible study by examining the parts of speech in the Hebrew or Greek text, which the Bible translation is based on, to understand the subtle nuances of the author. What does it mean: "Be angry, and yet do not sin?" Copyright © 2006 Helpmewithbiblestudy.org. All rights to this material are reserved. We encourage you to print the material for personal and non-profit use or link to this site. Please do not distribute articles to other web locations for retrieval or mirror at any other site. If you find this article to be a blessing, please share the link. Friend us in Facebook for article abstracts! As a federally registered Public Charity 509(a)(2) with IRS tax exemption 501(c)(3) since 2000, Helpmewithbiblestudy.org has been dedicated towards providing free Bible study resources on the web without any advertisements, sponsorships or solicitations. Develop your own theology: learn, challenge and help each other in the process of sanctification. When you became a Christian, did someone teach you how to read the Bible? Understanding and applying the Bible is difficult without some reading method. Helpmewithbiblestudy.org is designed to help Christians learn a sound and systematic method for reading, understanding, and applying God's Word. Each article has an accompanying PDF file to enable you to print ready-to-use lesson material. Non-commercial use of the print material is encouraged especially in support of family lessons / discussions, Bible studies, Sunday School, and missionary efforts. Grace introduces you to God's grace and love and provides thought provoking perspectives for those with a skeptical predisposition. Skill Builder focuses on teaching the basic skills needed to help you improve your Bible study method. Study Methods provides a tutorial and other examples that assemble the various skills learned in Skill Builder. Systematic Studies encourages you to think in a systematic manner so that you can develop a more coherent theology. Tools introduces you to various books and references that can enlighted your personal Bible study and are worthy of including in your library. While books and references are recommended, Helpmewithbiblestudy.org does not financially benefit from these endorsements in any way. Search provides a variety of ways for you to find articles within our site.